CORTEN STEEL, a combination of durability, hardness and style. Aesthetically perfect for the restoration of historical buildings thanks to the sensation of returning to the past that it communicates. Perfect for modern architecture, performing best when structural strength is required alongside aesthetic appeal, thus fulfilling all possible design requirements. One particular characteristic of Cor-Ten is natural oxidation in contact with the air: instead of continuing to corrode the material it stops, forming a protective layer which does not change over time. This natural process can be accelerated using oxidizing baths : these do not alter the physical features of the material but make it possible to obtain a unique finish with a porous surface whose warm brown and orange tones evoke an idea of time passing. 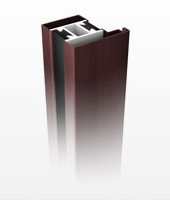 Looking for Best Materials for Fixtures?